The Converse All Star. Photo courtesy of Marc Roberts/Flickr. When Chuck Taylor, who was born in rural southern Indiana in 1901, left home at age 17 to play professional basketball, he was following an unlikely dream. The game of basketball—invented by James Naismith, a YMCA physical fitness instructor in Massachusetts in 1891—was still a minor sport in America. Few competitive leagues existed, and those that did were regional. Most organized teams were subsidized by large manufacturing concerns, such as General Electric or the Firestone Tire and Rubber Co., or by fraternal organizations such as the Knights of Columbus. Professional contracts hardly existed; players were paid $5 or $10 a game. You couldn’t make a living at that. Like struggling musicians or actors, basketball players needed a day job. But Taylor’s day job—selling the athletic shoes that he wore on court—became a lifelong career. Endowed with a love of the game, a showman’s flair, and just the right amount of self-aggrandizement, Taylor would become a veritable Johnny Appleseed for promoting basketball to Americans and around the world. By inventing himself, he helped invent what is now one of the most popular sports across the globe. Many people know the name Chuck Taylor from the autograph that since 1932 has been stamped on the ankle patch of hundreds of millions of Converse All Star shoes—the classic beloved by everyone from James Dean to Kurt Cobain to Michelle Obama. Larry Bird and Julius Irving wore them on the court. They’re a celebrity staple, unisex and multigenerational, a kind of “hipster” fashion statement. Today, Converse Chuck Taylor All Stars take their place among sports Americana with Louisville Slugger baseball bats and Chicago Schwinn bicycles. The real Chuck Taylor can sometimes seem like a fabrication, an ad-agency invention like Juan Valdez or Betty Crocker. In fact, Taylor was a standout forward at Columbus (Ind.) High School and captain of his team as a sophomore. He later played semi-pro and “industrial league” basketball in Indianapolis and Detroit. His most famous team was the Akron, Ohio-based Firestone Non-Skids. He proved to be a competent player but he was not the star he had been in high school. He made his name, instead, when in 1922 he took a full-time job selling the recently introduced All Star court shoe for the Converse Rubber Company’s Chicago regional office. The All Star wasn’t the first shoe of its type—rubber-soled with a canvas top. The A.G. Spalding and Bros. company had previously introduced a similar shoe, and “plimsoles” and “sneakers” had long existed in England. But the Converse All Star, introduced in 1917, improved on earlier designs, particularly with its diamond pattern sole that many believed led to quicker stops and starts on a hardwood court. The trademark on that design was upheld by a court ruling as recently as 2016. 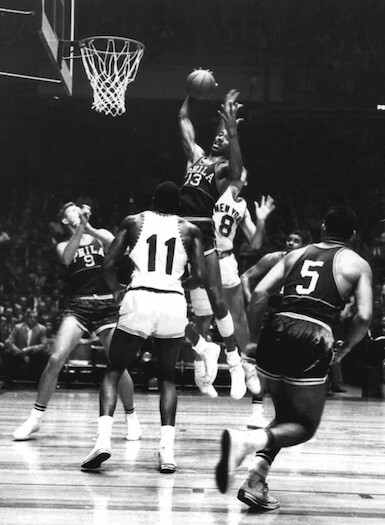 A 1960 basketball game with several pairs of Chuck Taylors on the court. Photo courtesy of Wikimedia Commons. Taylor was not a good salesman at first. According to a newspaper interview given by his widow, Lucy Taylor Hennessey, in 1979 with the Lansdale (Pa.) Reporter, he was nervous the first time he approached legendary coach Knute Rockne (he of “Win one for the Gipper” fame) at the University of Notre Dame fieldhouse. Rockne allegedly saw the young Taylor pacing outside his door and called him in, and then schooled him in the power of positive thinking and good sales technique. Taylor’s territory included selling to high schools and colleges, which typically outfitted student athletes at school expense. It wasn’t an obvious sell. Most basketball coaches were just football or baseball coaches with time on their hands in between seasons, and didn’t care much about the finer points of the new game. Taylor, who cared very much, had a brilliant idea to boost sales: Around 1925, he began organizing in-school “clinics” to demonstrate the sport. Grateful coaches appreciated his expertise and welcomed him—and ordered the Converse shoe. Before long, the clinics became public events, often co-hosted by a local sporting goods store. Taylor would explain the rules, do trick shots, and sometimes compete one-on-five against a local team, daring younger players to block his shots or steal the ball. His most famous trick was called “the invisible pass.” Taylor would thrust the ball toward the face of his opponent, then pass it quickly when the defender instinctively blinked. It was something of a cheat, of course, yet basketball was more of a rough-and-tumble sport in its early days, with far fewer rules and whistle calls than today. And Taylor was genuinely unstoppable against youthful players when he would dribble the ball from one end of the court to the other, weaving between a whole slew of defenders. It’s said that his passes were so forceful and straight that he could pass a ball under a truck underhanded without touching either the floor or the truck’s undercarriage. Taylor’s theatrics—with a boost from Converse’s financial sponsorship of the Kansas City-based National Association of Basketball Coaches—eventually made the Converse All Star the dominant basketball shoe in America. In time, the company would almost exclusively hire former players or coaches as salesmen, such as Grady Lewis (who was later to replace Taylor as Sales Manager), Canadian basketball player Bob Houbregs, and the important early African American player Earl Lloyd. Why was Taylor’s autograph added to the shoe in 1932, though? After all, he was just a salesman for the company, and while he had been a pro, he did not prove to be one of the stars of the game as an adult. It was a combination of his marketing skill (those clinics), plus the fact that he’d served for a time in the late 1920s as player/coach of the well-regarded Converse All-Stars (with the hyphen), the company’s own traveling basketball team. The Converse Rubber Co. had gone through a bankruptcy in 1928, and was sold and then sold again in the early 1930s. While it’s not known whose idea it was to put Taylor’s name on the shoe, his “brand” was clearly better than that of Converse at the time. Plus there was this little thing about the invention of “Chuck Taylor.” He was real, but he often exaggerated his earlier success as a professional, most notoriously claiming to have been a veteran of the most famous basketball team of the 1920s, the New York City-based Original Celtics. Historian Murry Nelson has written the definitive history of the Original Celtics and he found no evidence that Taylor ever played for that team. Before long, the clinics became public events, often co-hosted by a local sporting goods store. Taylor would explain the rules, do trick shots, and sometimes compete one-on-five against a local team, daring younger players to block his shots or steal the ball. Taylor was paid a fixed sum annually for his autograph. It’s not known how much he was paid annually (in one document dating from the early 1950s he received $15,000) but as a traveling salesman he lived on the road almost 365 days a year, staying in the finest hotels and expensing everything. He drove Chevrolets at first, then Lincolns and Cadillacs. Though he clearly was a showman, he proved his basic humanity in other ways. After his older brother, Howard, was blinded in France during World War I, Taylor supported him his entire life, even going so far as to insist in a divorce settlement that his estate must always pay Howard’s expenses off the top before any alimony payments would be made. Taylor also served his country during World War II as coach of the best “service” team in the military at the time, the Wright Field Air-Tecs, who competed in fundraisers against the best college and pro teams of the day and usually won. He toured South America as a goodwill ambassador for the U.S. State Department in the late 1950s. The real death knell of the canvas All Star in competitive sports came in 1969, when the most famous basketball coach in America, John Wooden, announced that going forward he would not outfit his players with the shoe. As he told Sports Illustrated and others, he was tired of personally trimming rough seams and loose threads inside the shoe. Converse brought Taylor out of retirement, flying him from his Florida home to meet in person with Wooden in Los Angeles, but to no avail. UCLA went to a new shoe the following year. Though Converse did eventually introduce newer, more modern footwear for competition, it was an uphill battle. Adidas, Reebok, and the upstart Nike (which now owns the Converse brand) all had taken their positions in the marketplace. Abe Aamidor is the author of Chuck Taylor, All Star: The True Story of the Man Behind the Most Famous Athletic Shoe in History and the novel Letting Go, to be published by the Permanent Press in October 2018.